What a run here by Thomas Combezou as they gets over the gainline!. Joe Simmonds has hooked the conversion to the right of the posts. Exeter decide to make a substitution, with Gareth Steenson getting some game time. Exeter decide to make a substitution, with Ollie Devoto being replaced. Exeter are stopped just a few metres from the try line but Luke Cowan-Dickie picks up from the base of the ruck to score the try. Castres sub Steve Mafi comes onto the field. Antoine Tichit comes on for Castres. David Smith leaves the field. Tudor Stroe (Castres) is shown the red card. Exeter go for goal with Joe Simmonds taking the conversion but his aim is not up to scratch as the ball slides to the left of the post. Castres decide to make a substitution, with Robert Ebersohn being replaced. Henry Slade scores the try from close range. Exeter sub Luke Cowan-Dickie comes onto the field. Anthony Jelonch comes on for Castres. Camille Gerondeau leaves the field. Benjamin Urdapilleta sets up the try. Thomas Combezou makes the break as the defence re-enacts the parting of the red sea. A wonderful passing move by Castres is finished off by Thomas Combezou. Fabulous play by Castres has led to David Smith being able to wriggle through a gap. Spellbinding play by Henry Slade is finished off with a try. The kick through from Exeter has allowed Tom O'Flaherty to touch down. Castres decide to make a substitution, with Rory Kockott getting some game time. Castres decide to make a substitution, with Ludovic Radosavljevic being replaced. Castres make a substitution with Tudor Stroe coming on. Castres make a substitution with Antoine Tichit coming off. Castres sub Kevin Firmin comes onto the field. Jody Jenneker departs for Castres. A gap opened in the defence and Tom O'Flaherty took full advantage. The defensive line has been broken as Joe Simmonds goes through the gap. Dave Dennis played a key part in that try. Santiago Cordero comes on for Exeter. What a run here by Geoffrey Palis as they gets over the gainline!. Sam Skinner makes the break as the defence re-enacts the parting of the red sea. Camille Gerondeau has made 10 good tackles so far this game. Fabulous play by Exeter has led to Jack Nowell being able to wriggle through a gap. Joe Simmonds curls the ball too far, missing the posts to the left. That's a great try assist by Ollie Devoto. A series of passes by Exeter results in a try for Joe Simmonds. This is dangerous for the defence as Jonny Hill bursts through to advance the Exeter attack. Benjamin Urdapilleta hits the left post with the conversion, failing to add the two points. A gap opened in the defence and Taylor Paris took full advantage. Great hands by Castres leads to a try for Taylor Paris. Joe Simmonds has hooked the conversion to the left of the posts. A stunning solo try from Jack Nowell. 👏👏👏 - Want to see it again? RT @btsportrugby: "It started raining and they took me off!" ▫️The 24-year-old is jumping back into a pool of sharks and backing himself to rise to the surface. That’s my lot for today. Will be at Munster next week but being a civilian and no Tweeting. Rob Baxter: Weren’t as great defensively as we can be. Both teams were intent on attack. And so. On to Munster . . .
Essai refusé pour Thomas Combezou. 62 Tremendous kick by White pins Castres back in their 22. Steve Mafi remplace Loïc Jacquet. 58 A couple of lovely sit down moments from O'Flaherty and Cowan-Dickie. 55 The weather has taken a distinct turn for the worse. Rain replacing that winter sunshine. Joe Simmonds ne transforme pas l'essai. 29-12. 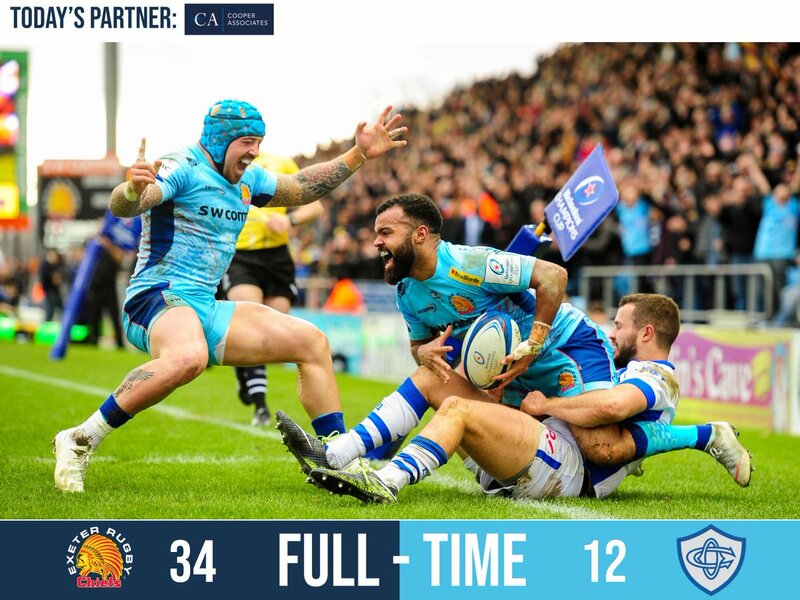 Essai pour @ExeterChiefs. 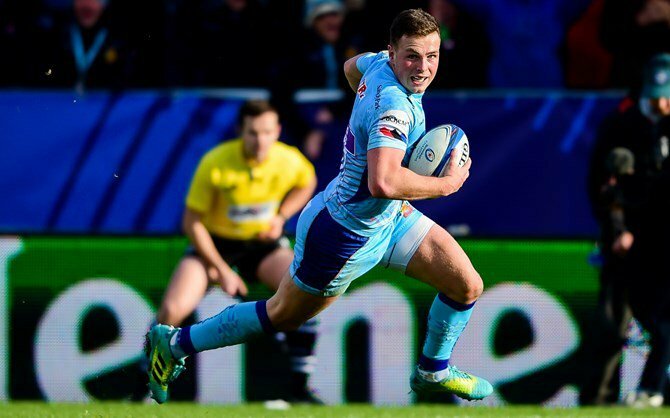 Henry Slade s'échappe d'un regroupement et va inscrire le 5e essai anglais. 29-12. 53 TRY Chiefs. That silky runner @Sladey_10 uses all his pace and guile - to go 2m from a breakdown to score. Marc Clerc, Anthony Jelonch et Alex Tulou remplacent Daniel Kotze, @CamilleGRDO et Ma'ama Vaipulu.